XYO and Dapps Inc. — Bringing Ethereum and Location Data to Salesforce! Ever since blockchain became the tech of the future, humanity has been working feverishly to use it — and connect it to — enterprise systems. The ideas and potential use cases range from hyper-practical to completely mind-blowing. But most developers get to the point where that enterprise software or SaaS platform is supposed to make that Ethereum ecosystem handshake, and they suddenly feel like they’re standing at the edge of a deep, dark canyon — where the bridge is totally gone. And then there’s the challenge of disparate technology and the supply chain, as well as the inaccurate data provided along the way. The supply chain needs to be improved, but how? And then there’s Dapps Inc., our fearless new partner. Over the last few years, Dapps Inc. team has built a bridge — middleware — from the Ethereum ecosystem and Ethereum, to oracles like XYO, and all the way to the world’s most popular cloud computing provider of sales and CRM tools, Salesforce. Salesforce has an estimated 150,000 customers, and 4 million+ individual users. Now, millions of B2B Salesforce customers who want to do business on the blockchain finally have the bridge they’ve been waiting for. So, how does XYO fit into this partnership? A manufacturer of advanced AV equipment makes a deal to deliver an expensive, high-tech film projector to a technical school. Part of the agreement is that the school, which will be paid via tokens, will settle with the electronics maker only when unit arrives. Using Dapps Inc.’s, Dappsuite, which integrates into Salesforce’s Lightning Ethereum client, a user can create a smart contract that activates payment once the film projector arrives. The best part is this can all be tied to the company profiles of both sides — school and AV system provider — in Salesforce. Naturally, different types of verification are being used within Dappsuite. But location is one of the most important, and by providing this crucial info, the smart contracts we’ve all been talking about for so long — the ones based on getting something from point A to point B, with an automatic payment trigger based on verification — are finally possible. Dappsuite works on public or private Ethereum networks, offers a mobile token interface, and features a custom smart contract library. 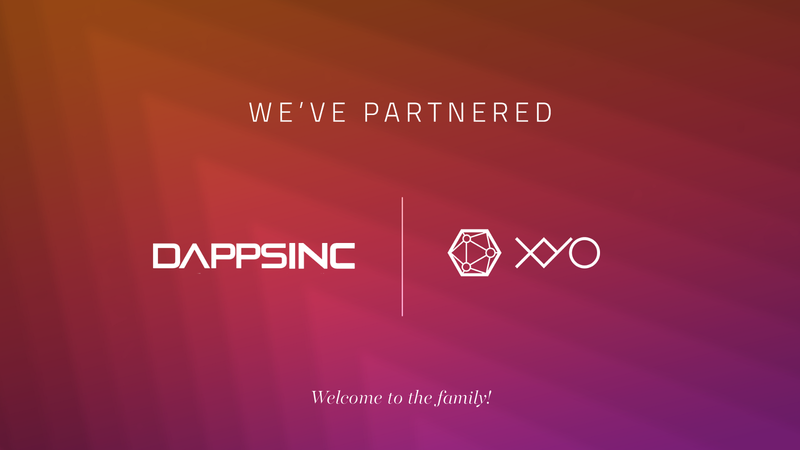 And because they’ve made smart contracts so simple for a giant like Salesforce, we’re thrilled to welcome Dapps Inc. to the XYO family!